I've always liked Plague Marines. Way back I entertained images of Plague Marines, pickelhaube and archaic power armor proudly if rottenly worn, toiling in WWI type trenches, raiding across desolate landscapes rife with disease, rats and poison gas. Alongside these elite shock troopers would be legions of lesser gas-masked troopers and even the walking dead, serving alongside men who may as well be corpses themselves. At the time there was nothing to really support such a mixed force, so the idea was pushed towards the back. Later, the Eye of Terror Codex and the Lost and the Damned army list it contained allowed just such a force, and the idea resurfaced, along with the Steel Legion troopers as the Plague Marines' backup, nicely gasmasked faceless minions. The army came towards the front, and Lost and the Damned forces were played quite a bit, but the full force never came to fruition before edition and codex changes swept Lost and the Damned away, along with the idea. But it didn't go away altogether. It festered and took root, incubating until conditions were right to flower. 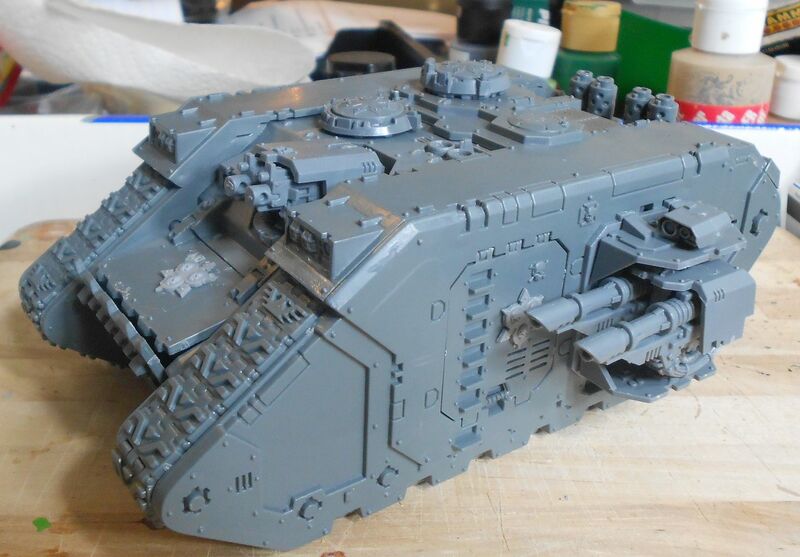 Now, with Allies, a Chaos Marine/Imperial Guard combo is quite possible, and my acquisitions over the years have yielded sufficient forces for such an army. Above are two such acquisitions, a Nurgle dreadnought and a daemon prince, which will be kept in the foam pending ascendant champions. Recently I went on vacation, and thinking I might have some extra time at nights looked for something to bring along. Not wanting to take paints into someones home, I looked for construction projects. I poked around and sure enough, there was sufficient to start the Nurglies, so they got organized and packed away for the trip. The Land Raider makes a great tank that evokes WWI, which is no surprise given that its original inspiration came from tanks of that era. It will get some more bits and work before it is finished, but it won't be covered in greenstuff or anything like some Nurgle vehicles tend to get. A tank like that needs some impressive passengers. 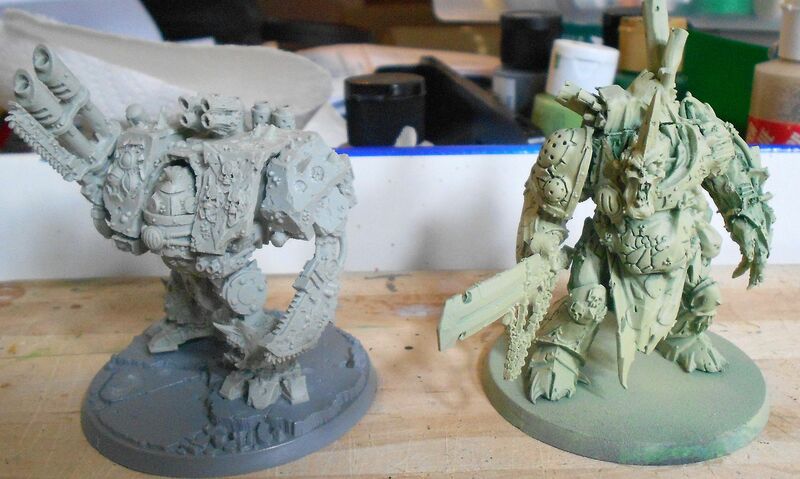 Typhus and some terminators should work nicely. Typhus also lets me use a batch of old zombies I have had since the old LatD days and recently touched up. I don't plan any of the extreme lists like 210 zombies, but one mob of shuffling dead would work nicely. A bunch of plague marines. There are some extra bodies available to mix things up, but here's the initial batch of small squads. Some old school nurgle renegades. Old metal spawn for when champions get unlucky, and old metal Great Unclean One that may serve double backup duty, either as an extra spawn or extra Daemon Prince depending on how the dice go! 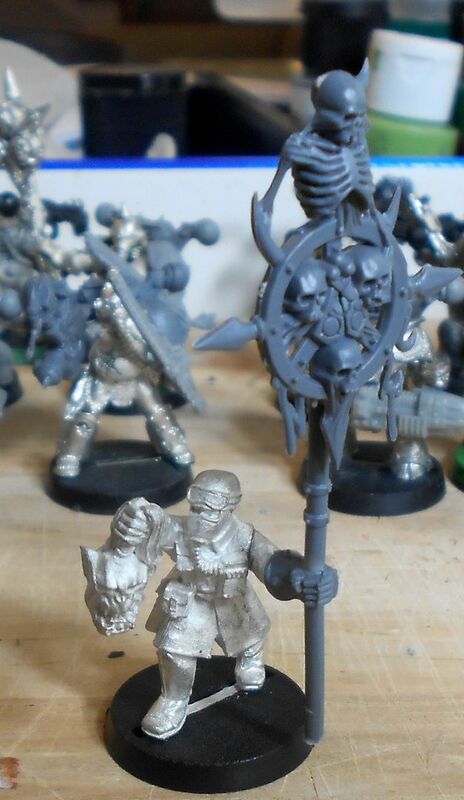 Possible banner bearer for the Grave Diggers, the IG allied contingent. Just a few squads of guys with likely something like a hydra or artillery piece. For the plague marines I'm thinking sort of dirty off-white instead of the greens often seen. Not sure about the Grave Diggers, but probably some kind of earth tones. Basing will be urban rubble, letting them mix in with the Endless Ones CSM easily. Grandfather Nurgle welcomes everyone, eventually. Now to hack up some phlegm into the paint pots and get painting.